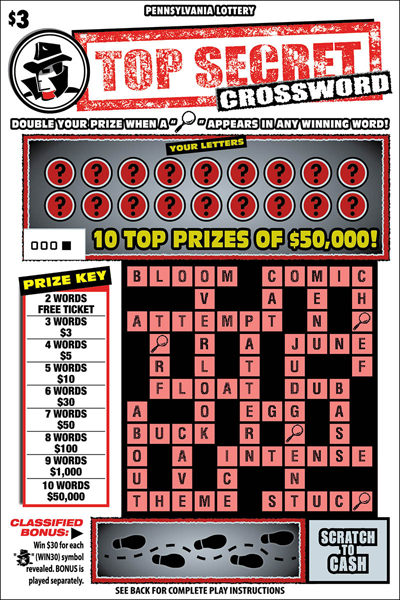 Top Secret Crossword is a $3 game that offers 10 top prizes of $50,000. 1. Scratch YOUR LETTERS to reveal 18 letters. Rub each matching letter every time it is found in the Crossword Grid. Each letter's square, when rubbed gently, will turn white. 2. 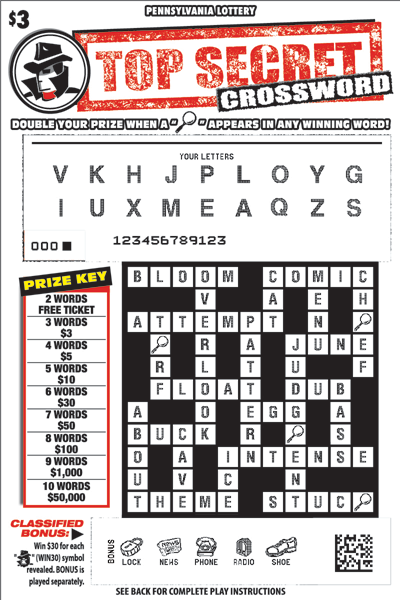 When you have matched the letters of two (2) or more entire words in the Crossword Grid, win the corresponding prize shown in the PRIZE KEY. Only the highest prize won in the Crossword Grid will be paid. 3. Scratch each "MAGNIFYING GLASS" symbol that appears in the Crossword Grid. Each "MAGNIFYING GLASS" symbol is a free spot. When a "MAGNIFYING GLASS" symbol appears in any winning combination of words, win DOUBLE the corresponding prize found in the PRIZE KEY. CLASSIFIED BONUS: Win $30 for each "DETECTIVE" (WIN30) symbol revealed. BONUS is played separately.